Thunder woke a lot of folks out of bed this morning, but after a very wet start to the day, the sun took control and just about baked any beneficial water right out of the ground. We need a steady soaking to put a dent in the drought, but unfortunately, the forecast is only calling for a glancing shot at some rain in the next few days. Tomorrow the focus is on Northern New England for the wet weather, with only a few showers roaming into Southern New England. By Thursday, the roles are reversed, as the steadiest (and perhaps heaviest) rain is focused on Massachusetts, Connecticut and Rhode Island. What's certain for everyone is a drop in the temperatures. They won't be dramatic, but they will be enough to be noticeable. We'll go from widepread 80s today, back down into the 70s - and possibly some 60s - over the next two days. 80 degree warmth stays intact across Connecticut and Rhode Island, however. Speaking of warmth, there is still plenty of it in the forecast ahead. 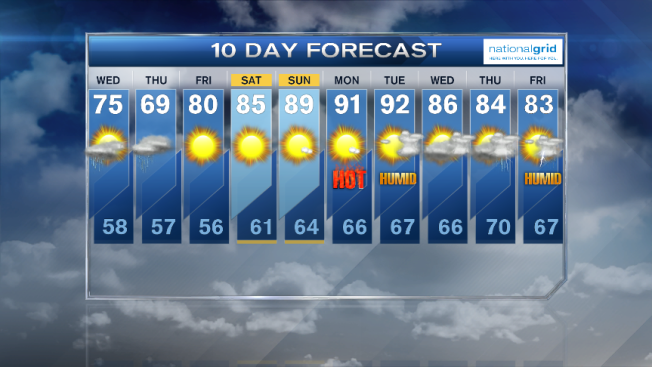 Heat will bear down by the weekend, and we could be on the verge of a heat wave by early next week!